I wanted to experience the social struggles someone faces when going sober in an alcohol dominated society/social group. I live in a city with a rather robust alcohol scene. There are some 84 micro breweries in the Portland Metro area, an entire craft distillers scene down the road from my home, and we’re just a hope, skip, and jump away from some amazing wineries. Sometimes it feels like you’re hard pressed in Portland to find a weekend without some sort of beer or whiskey festival. 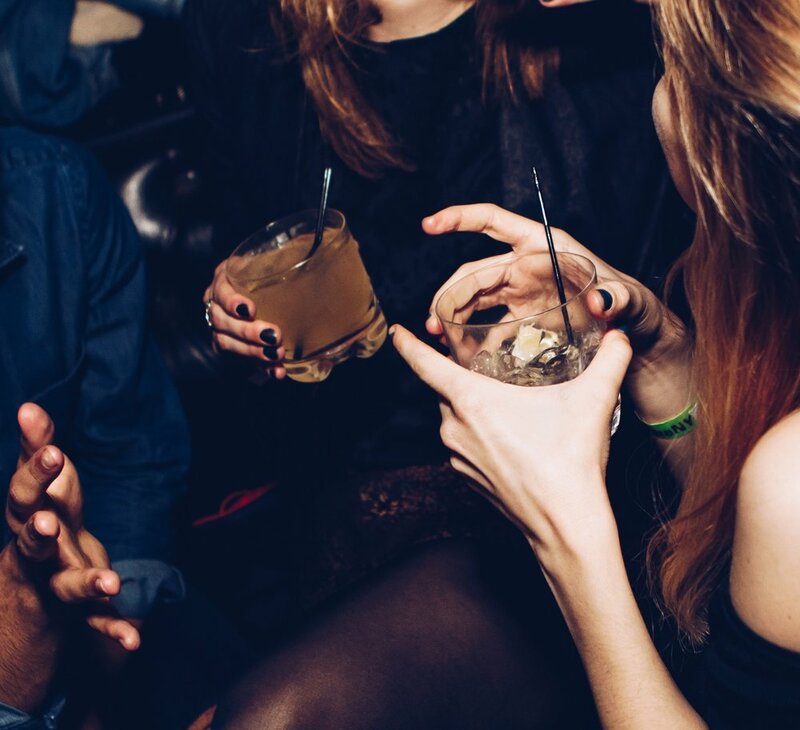 Not drinking while maintaining a social life can be a challenge anywhere, and it was probably the most difficult aspect of the past 100 days for me. I wanted to draw attention to the very black and white way we view alcoholism in our culture. I am not an alcoholic by any traditional definition: Drinking wasn’t negatively impacting my career or my relationships with my friends and family. I also didn’t experience self control issues around alcohol. I’m usually good at being able to cut myself off or stick to just one drink while out. Nevertheless, I still kind of felt like alcohol wasn’t always a positive thing in my life. You don’t have to be an alcoholic to be using alcohol as a crutch or an escape, or have it exasperate other issues in your life (like depression and stress). So why not just go sober for one month? I asked myself that question a lot, particularly around 3 weeks into it. I wanted to be sober for the full 100 days because I felt one month would be too easy, it wouldn’t be a long enough period of time to really grasp the experience, and I had a few personal goals that I wanted to achieve while sober and one month just didn’t seem long enough (30 days to create a habit, 90 to create a lifestyle, etc). I’m really glad I went for a longer time period because the experience of being sober days 1-30 was definitely different than my experience days 60-100. If you want to compare my thoughts on being sober after 100 days to my thoughts when I hit the halfway mark, you can check out a blog post I wrote on being half-way there. Stage 1: The beginning. Being sober in a group felt easy at the start. My motivation was high. The experience was new. I was all about explaining to people why I was going sober and my views on alcohol consumption. Stage 2: The middle. This was the toughest part. I was use to being sober and the new-ness of it all had worn off. I started to get more bummed out when I would miss stuff, like a beer festival or even just a seasonal brew. I started to feel less enthusiastic about going out and being the sober person in the group, and I was fulling feeling the hit to my social life. Stage 3: The end. By the last few weeks, maybe the last full month, being sober became such a standard in my life it didn’t feel odd or like I was missing out. It’s become my normal and it wasn’t bothersome. I’ve started to forget what it feels like to drink. I started really enjoying just how productive I became (being single and sober = a lot more nights at home getting everything else I wanted to do done). To the people in my life who were incredibly supportive and overall awesome about hanging out with sober Gretchen, thank you! You’re the rock stars that helped me discover that if I were to ever have to give up drinking forever, life really wouldn’t be that bad. Need to save money? Not drinking alcohol will certainly help. From savings on my grocery bill by not grabbing those six-packs or bottles of wine, to cutting my bar bill down by half or more, sticking to nonalcoholic beverages totally saved me money (I used these savings to fund other pursuits instead of actually, like, saving it… so, that kind of negated the savings on my end, but you can learn from the error in my reckless ways). I ate out less and quite often didn’t even get charged when ordering soda water at a bar. Now, I don’t drink soda pop or anything sugary or chemical. But I do love club soda (particularly with a dash of bitters or drinking vinegar). I love drinking soda water so much that I eventually invested in a SodaStream so I can make it at home instead of buying 2-4 bottles from the store daily. (Yes daily. I drink that much water). I did continue my wine club membership and picked up a couple of bottles of seasonal beers that I wanted to save for when I was drinking again, so I did spend some money on alcohol, but not nearly as much as I would have if I was actually consuming it. When I was about half through and you asked me how I felt about drinking again, I was totally excited. Now that it’s here? I’m honestly really conflicted. I’m both nervous and excited to drink again. (At the time of writing this, I haven’t had any alcohol yet). I’m looking forward to drinking some amazing wines and seasonal beers I’ve been stock piling. I’m also really excited for a girls night out I have planned for Friday (we’re going out and staying the night at the Edgefield resort so we can drink without needing arrange a ride home). I’m looking forward to being able to opt in to drinking when I want to. I’m feeling a little nervous because drinking feels more unknown again. Kind of like when I was 21, I have no concept for what my tolerance level will be (I suspect it’ll be totally shot so I’m preparing for that). I feel so good not drinking and I want to make sure I retain that feeling and keep the lifestyle I’ve established while not drinking. My hope is that I can reintroduce alcohol without compromising all the gains I’ve made in life while being sober. While I feel like that is something totally do-able, I could also see myself deciding my life is better when I’m sober and making this a permeant change in my life. That was not something I expected to come out of my 100 days, but it goes back towards illustrating my point on how gray-zone the concept of alcoholism really is than we traditionally view it. Yay!! I have been looking forward to this post. I’m so impressed that you completed the 100 days! That’s pretty much a third of the year. Right now I am also in the process of re-examining my relationship to a particular substance through abstaining as well. I was really pleased with the initial gains (a whole lot of mental clarity, less sleep issues, one less time constraint on my schedule to adhere to), but now I am firmly in what you called stage 2. The ennui has set in. I started off with grand plans of making this a permanent change in my life, and I’m still hoping to stick to that plan. How would you compare the experience of giving up alcohol vs giving up sugar? So I found the alcohol harder than the sugar. Giving up sugar made going out to eat (like brunch food) difficult but alcohol had a much more profound effect on my social life. I also found people’s reactions different: with sugar people treated me like I was on a diet but with alcohol, so many people treated me like I couldn’t step anywhere near a bar. They were more awkward. (I started just ambushing people with my soberness after we were already at the bar so they would know I’m totally cool with chilling with people while they drink). 100 days is a long time too, lol. It’s interesting to think of everything that’s happened in my life between the last time I drank and now. You are an inspiration. I have stopped consuming alcohol on week days, mostly to cut calories, and I have found that I am so much more efficient with my weekday evenings. I get more done, sleep better and have the sense of restfulness that allows me to get up at 4:45 AM to go for a run and work out. I am now spending my evenings doing a simple household chore and making time for yoga and meditation. Instead of alcohol, I am enjoying wonderful teas and a lot of sparkling water which I love to flavor with bitters or extracts. Unforeseen bonus, don’t really drink much on weekends either.